Boil a medium pot of water with salt. Add the orzo and cook until they're tender, about 8 to 10 minutes. Strain and rinse with cold water. Mix the pasta, beans, corn, pepper, tomato, cilantro, onion, lemon juice, vinegar and salt/pepper to taste in a large bowl. This salad can also be prepared with elbow pasta, quinoa, rice or couscous. Summer is here and salads are sure to become our best friends. They are the perfect dish because they're wholesome, quickly prepared, light and refreshing. The recipe I am sharing with your today uses a few ingredients I had in the fridge and that I like, but as I always say, use what you prefer or what you have at hand. 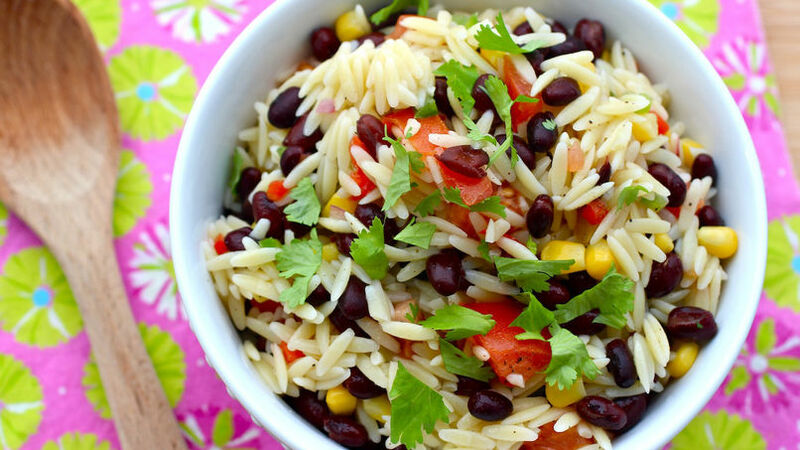 This orzo, corn and black bean salad is the one I love preparing for potlucks, picnics or BBQs and I'm sure you'll love it too!